You know how some of the best restaurants are found in a “hole in the wall?” I think that’s true for a lot of things; even thrift stores. I had been “dying” to try some milk paint, so when I stumbled upon a great furniture piece recently, I knew what my new furniture project would be; creating a DIY Milk painted coffee table. It all started when I was on my way to pick my son up from school. I passed this little “hole in the wall” thrift store that I had been eyeing for quite a while now, so I finally decided it was time to stop. So glad I did, because I found a great coffee table I could turn from trash to treasure. I have a rule for myself when I’m thrifting; if I find a piece of furniture i’m interested in it needs to be a solid piece of furniture. Basically this rule boils down to this; no cheap junk. So when I found this old coffee table, which looked terrible on the outside, I knew it had potential because it was so sturdy and heavy. Ahhhh, my insides were screaming with excitement. I said, “sure, I’ll take it.” I paid, packed her up in the mini, and off we went with my new find. These small cut marks are what the sales lady was talking about when she referred to the table as a “saw horse.” Nothing a little wood filler couldn’t fix. After I cleaned it up, I lightly sanded the entire piece because it looked like someone had painted and then repainted and repainted. Then I filled in the “holes” as well as I could with wood filler. Then I sanded again. This table has really been more of an experiment because I had only planned on doing a little sanding, then a few coats of MILK PAINT and then distressing. But the more I worked, the more ideas I had, and the more work it became. 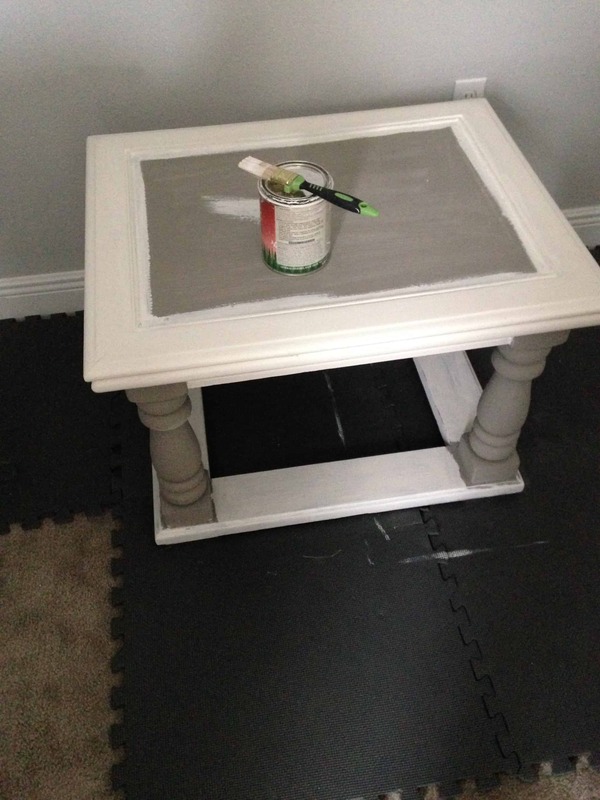 After I sanded the coffee table, I painted it with General Finishes Milk paint old White. I still wanted to add a little more color. 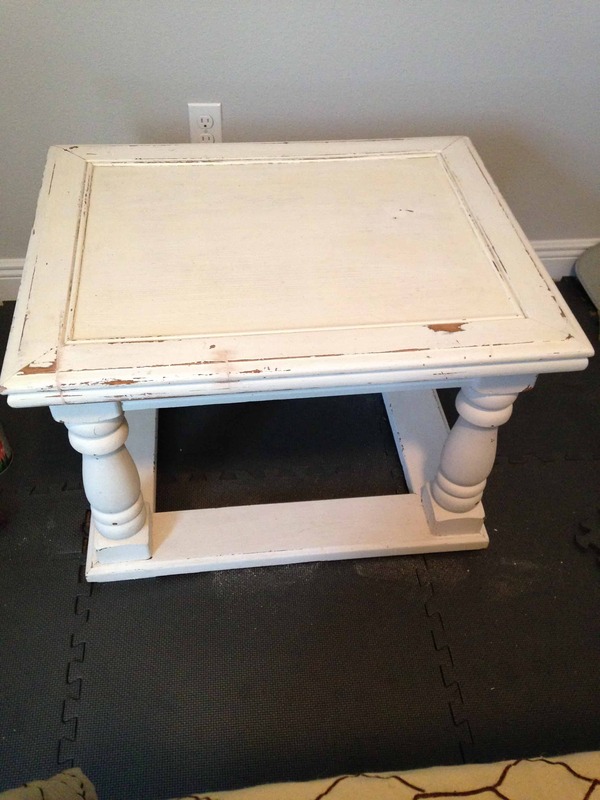 I added some Annie Sloan Chalk Paint Grey to the top and the legs. I decided a “two toned” look might be nice. I still wasn’t happy with it and thought I wanted more than just grey, so maybe a faux wood top? Off to Lowe’s for a thin strip of wood to stain. I decided to buy BIRCHWOOD because it was very thin, cheap, and Lowe’s was able to cut it to the size I needed to fit the top of the table. After staining the birchwood, I used wood glue to attach it to the table. Then I decided the color of the coffee table legs need to match the color of the top of the table. 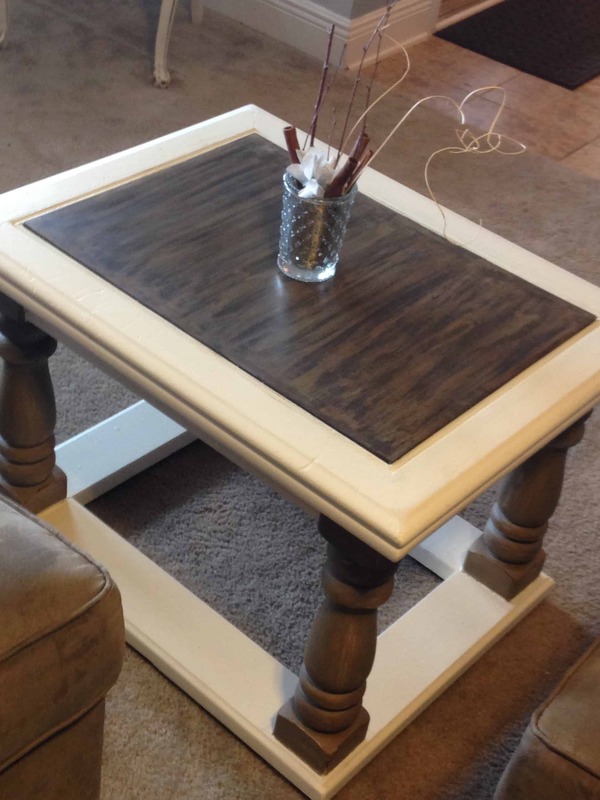 I used Annie Sloan Dark Wax for the legs so they would match the top better. 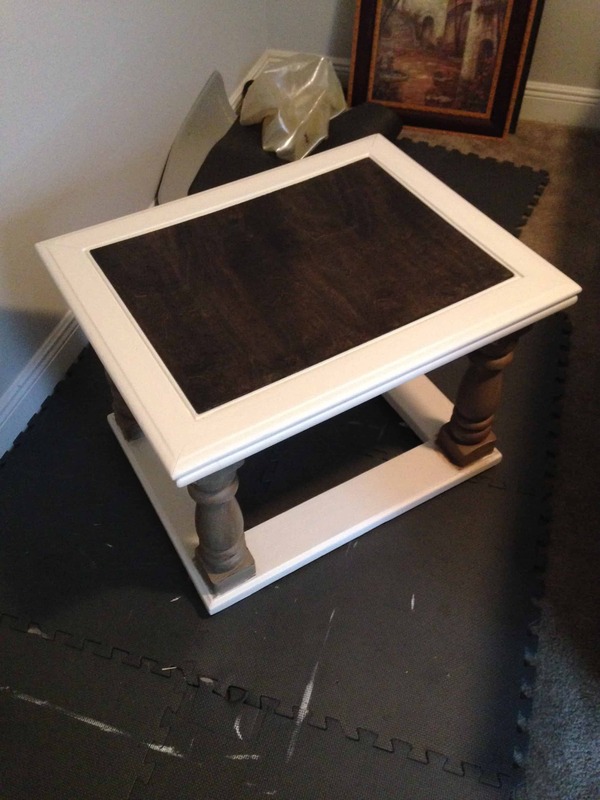 After completing all four legs I STILL wasn’t happy because the legs STILL looked different than the top, so off to paint the top with more Annie Sloan Chalk Paint Grey. I then sanded the top to give it a more “distressed” look to match the legs, then completed it with the dark wax. What do y’all think? Did I make too much work for myself on this furniture project? 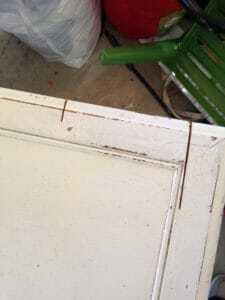 Sometimes I can go a little crazy when it comes to refinishing furniture. In the end, all it takes a little creativity and an open mind, and you really can find great steals at thrift stores. 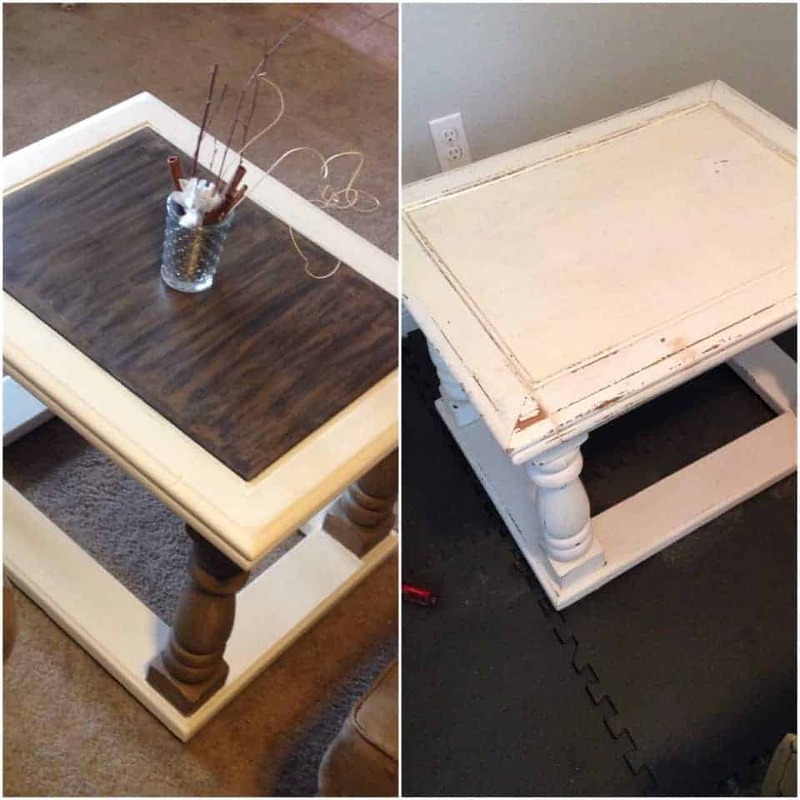 To see more repurposed and upcycled furniture pieces click HERE. Wow! Great job! Thanks so much for sharing! Love the modern twist you created for this piece Lindsey, a wonderful update for this thrifty find! Thanks so much for sharing at Fridays Furniture Fix!